I LOVE DUMPLINGS. 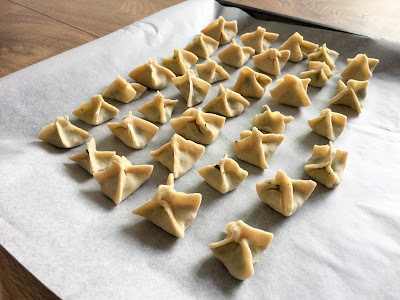 I was helping a friend out with a pescatarian supperclub recently, and in doing so we made manti - a Turkish dumpling that's also found in Russia and Central Asia. The origins of the dumplings are uncertain, though it is believed that the recipe was carried from Central Asia through the Silk Road to Anatolia and China by Turkic peoples (thanks Wikipedia!). Essentially, they're dumplings made with an egg-enriched wheat dough, filled with a spiced meat mixture, and often served with yoghurt. 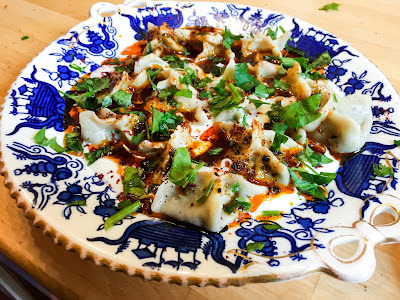 I tested the recipe first because I LOVE DUMPLINGS but also dumplings can be notoriously difficult to fold, and vegetarian fillings can sometimes be a touch on the bland side. We made this up completely as there weren't many of its vegetarian kind to be found on the internet and I'm not sure how traditional they are given our tweaks, but it has warming spices like cinnamon in them, mixed with the zest of lemon, the zip of parsley and a robust minerality of spinach and chard. Balanced on garlic yogurt, drizzled with chilli oil and dusted with sumac, these dumplings were swept off their plates hungrily. They're not too much of a pain to make, either, as long as you have a bit of patience. The dough and garlic yoghurt is largely taken from this recipe, though we had a couple of tweaks - I'm not a massive fan of the flavour of dried mint, so I reduced it down. 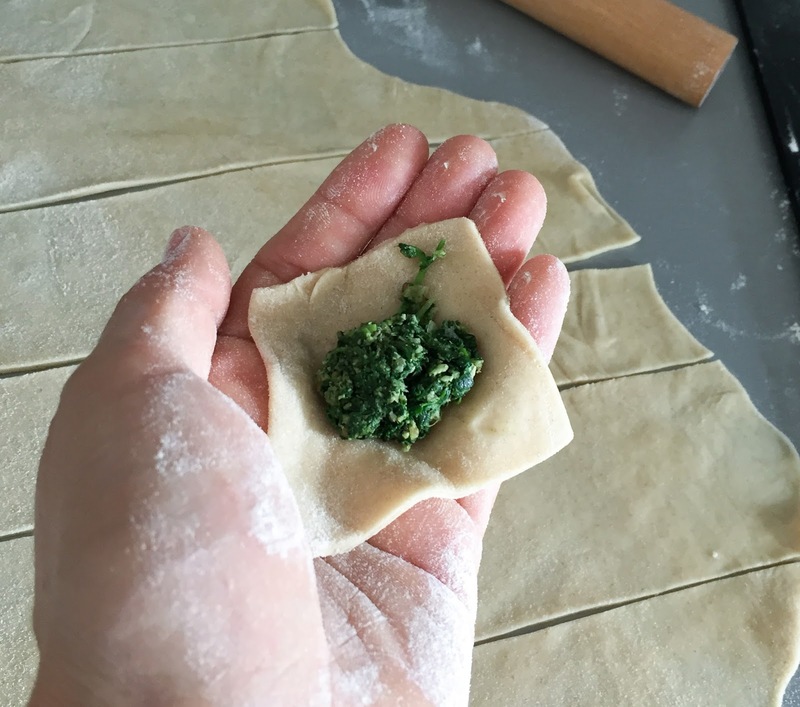 You need to roll the dough as thinly as you can, using a long, thin rolling pin and work to small parcels so that they're light and delicate rather than huge and stodgy. These are tips I picked up from Helen, so hat tip to her as well. 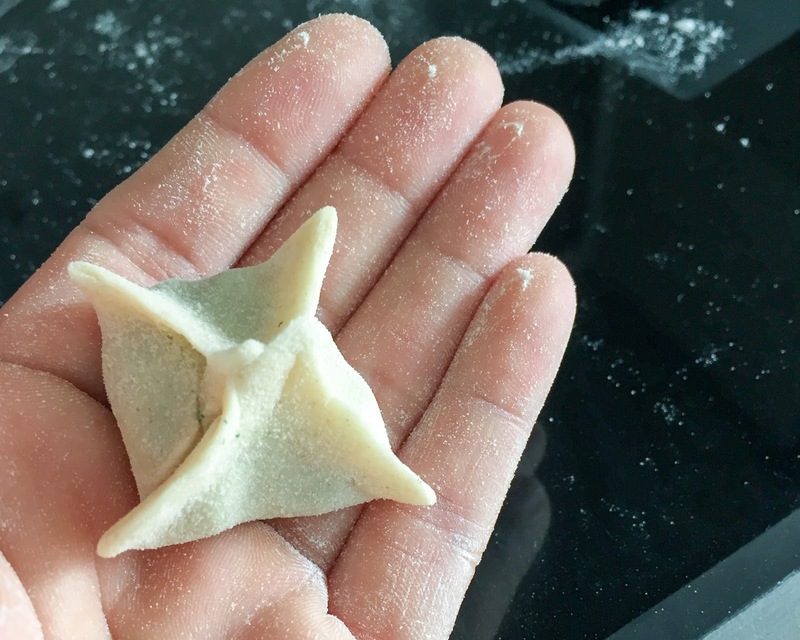 The folding of the dumplings is wonderfully simple - you take opposite corners and you pinch together to form a cross shape. This one was one of my first; you'll want to make them a little smaller. This recipe makes many many manti, but they're freezable and because they're baked first, they keep in the fridge a while. I have no idea why this is baked and then boiled, while most recipes straight-up boil but the baking means they do last longer - if you're going to eat them right away, you can go straight for the boil and miss out the baking stage. Sift the flour and salt into a bowl, then add the egg and the oil and bring together to form the dough. Knead for 6 minutes, until you get a smooth dough, and then cling film and leave to rest for 30 minutes. Meanwhile, make the filling. Blanch the spinach, refresh in iced water. Blanch the chard by adding the stalks 40 seconds before the leaves, as they take longer to cook. Refresh in iced water. Drain and squeeze the moisture out of both vegetables thoroughly, and place in a food processor. Add the walnuts, parsley, garlic, cinnamon, za'tar, lemon zest and olive oil and pulse until well pulsed. If it's looking too wet add the breadcrumbs - it should hold together well but not be sloppy. Mince the garlic well with the salt and add to the yoghurt. Stir well. 1 tsp urfa chilli flakes (again, buy in the Turkish Food Centre) - these are slightly darker, and milder and smokier than pul biber. You can use just pul biber if you wish. Heat the oil up in a small saucepan and add the hot pepper paste. Fry until fragrant, around 2 minutes, on a medium heat and then add the chilli, sumac and mint flakes. Simmer for around 3 or 4 minutes, then take off the heat. Line up a baking sheet or tray with greaseproof paper. Split the dough into 3, and re-wrap the other two. Working with one ball at a time, roll out as thinly as you can and then cut squares out of it - working to around an inch size. Maybe start slightly bigger until you have the hang of it. Use a pizza cutter to cut the dough as it's slightly easier. Add a teaspoon or less of filling to the centre of each square and bring the opposing ends up to join into a cross shape. Seal well and place on the baking tray. Repeat until the dough or the filling is gone or you're bored shitless. Preheat the over to 180 degrees and bake for 10 minutes, until slightly golden. Wait for them to cool if you're going to saving them for later - they last about 3 days in the fridge, or can be frozen - otherwise then simmer them in water for 8 minutes, before draining. To serve, add a generous amount of yoghurt to each dish. 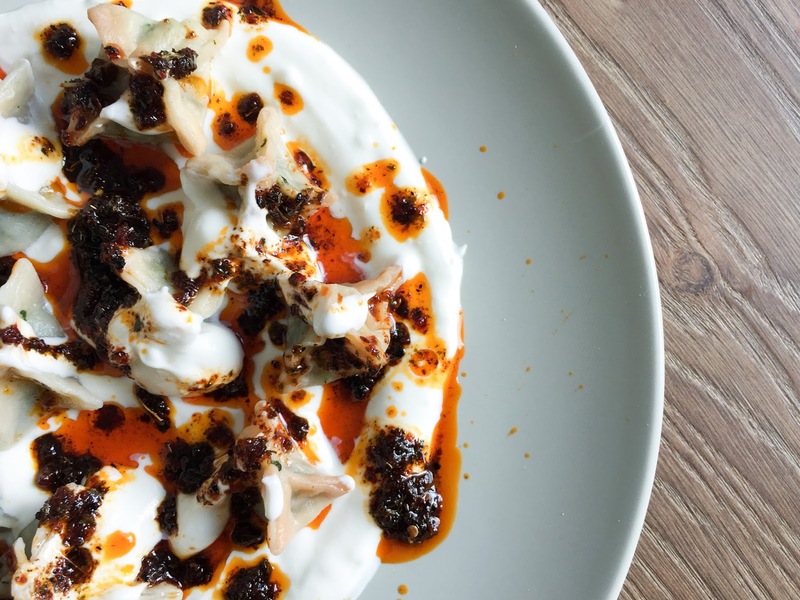 Place the manti on top of the yoghurt and drizzle with the spiced oil. Garnish with a hefty pinch of sumac and a sprinkling of parsley.